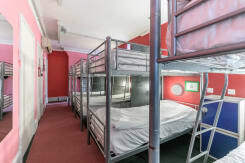 Keystone House is a 140-bed hostel located in the heart of London, within two minutes' walk from Kings Cross and St Pancras stations. 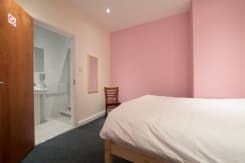 The locality itself makes it within easy reach of London's West End, Camden Town, Oxford Circus, the city centre and famous tourist attractions and sights. Kings Cross and St. Pancras stations provide excellent transport links including the tube, bus, overground trains and of course, the Eurostar which operates out of St Pancras. 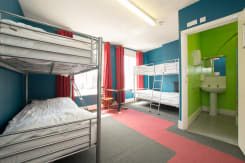 The Hostel was opened in 2010; therefore, all the facilities are of a good standard and rooms offer a comfortable modern atmosphere. 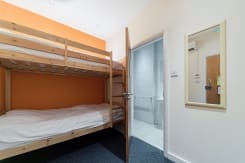 Special features include the Backpackers Bar, 24-hour reception, internet café , laundry facilities and FREE WIFI in the common room. Our friendly staff are onsite and available 24/7 and security is taken seriously with 24 Hr CCTV in place. Inspired by your feedback we have permanently lowered our room and bed rates, a complimentary self-service breakfast of cereal, toast and tea and coffee is on offer in house. If you wish to head out for a more diverse breakfast choice, have joined forces with the nearby Station Café. 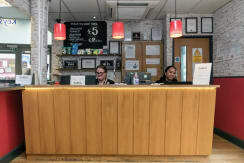 There you will not only get your breakfast at discounted rates, but you will get the chance to enjoy an authentic London cafe – popular with the locals. Breakfast is available daily between 7am and 10am. 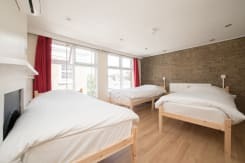 Please note that our two-bed basic twin private (or LU (London underground)) rooms are inner cabin rooms without windows but are said to be more peaceful. 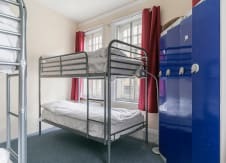 Three bed basic rooms might be affected by noise due to its location underneath the bar and common room. Also most of our 3 bed private rooms have one single and one double bed. If you wish to book a room with three single beds please contact us directly. Parents or guardians and family members with children under 18 must book the whole room. Minors under the age of 18 must be accompanied by an adult guardian or parent and are not permitted in shared rooms. A valid passport or picture id is required for check-in for all guests! Check-in: 14.00. Check-out: 10.00 am. A valid passport or picture ID is required for check in for all guests. 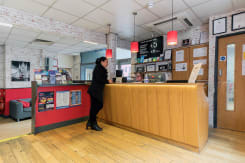 Due to an increase in credit/debit card fraud from the 1st of October 2016 we will pre-authorise your debit or credit card for the total cost of your reservation 14days prior to your arrival, this will not take payment from your account but will provide confirmation to us that you are using a valid payment method. If the pre-authorisation declines we will contact you to provide an alternative payment method, failure to supply this may result in your reservation being cancelled. 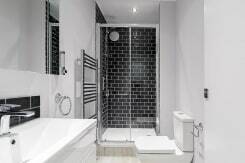 Parents or guardians and family members with children under 18 have to book the whole ensuite room. Bookings cancelled with 2-14days prior to arrival 70% of the cost is charged. Bookings cancelled with less than 48hours to arrival then the full cost will be charged. Full details of our Terms and Conditions and Privacy Policies can be viewed on our website. We are one minutes walk from Kings Cross Underground and National Rail Station and St Pancras National and International Rail Service. Leave Kings Cross through the Euston Rd exit. Turn left on Euston Road to Pentonville Road and pass McDonalds on your left. We are 80 metres on the left at the junction of Caledonian Road. Alternately, leave Kings Cross via the Pentonville Rd exit; we are directly opposite. We are located one minute from Kings Cross Underground and St. Pancras National and International Rail Stations and the Eurostar. Close to Covent Garden, Oxford Street, Leicester Square, West End, Camden Town, Angel Islington, Brick Lane, Shoreditch, St Paul's, Westminster and everything in London.